Photomicrograph of the body of a motor neuron. 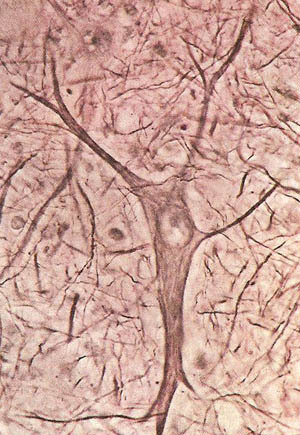 The cell nucleus and the sensory dendrites are clearly visible. The motor axon leaves at the bottom of the picture. A motor neuron is one of the nerve cells (neurons) that goes to make up the nerve pathway (motor nerves) between the brain and an effector organ, such as a skeletal muscle. An upper motor neuron has a cell body in the brain and an axon that extends into the spinal cord, where it ends in synapses. It is thus entirely within the central nervous system. A lower motor neuron, on the other hand, has a cell body in the spinal cord or brainstem and an axon that extends outwards in a cranial or spinal motor nerve to reach an effector. See also sensory nerve.